WHAT The Telluride Trail Running Retreat is a great running vacation and introduction to the amazing trails in the Telluride area. 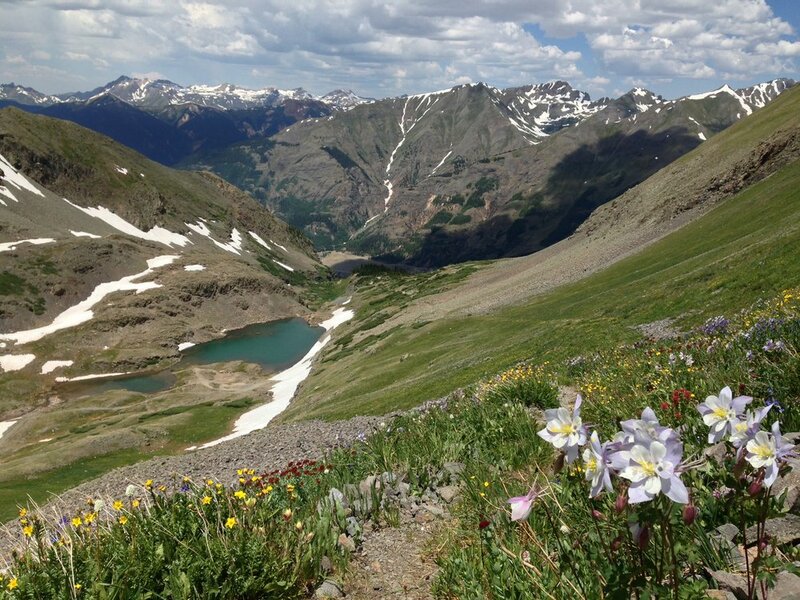 You will have the opportunity to run trails to cascading waterfalls, run through beautiful aspen forests and explore the alpine tundra of the San Juan high country. This retreat is a perfect trail running getaway for those without a lot of free time who want an unforgettable mountain running experience in Southwest Colorado. During this 4-day retreat you will have the opportunity to run on four separate outings on amazing mountain single track trails. This will include a shorter acclimatisation run, a longer scenic run through colourful forests, and two unforgettable runs through the alpine tundra and wildflowers. Most runs during this getaway are considered to be of moderate level and we encourage all participants to arrive in good running condition. This is a perfect trip for both experienced trail runners and those new to the sport looking to experience the joy of trail running in Telluride on the beautiful mountain trails. During this all inclusive retreat you will spend four days around the historic town of Telluride, stay at a comfortable hotel, dine at local restaurants and experience the beauty of summer in the San Juans. WHO This adventure has intermediate level runs with possible distances up to 15 miles and moderate elevation gain with possible altitudes up to 13,000ft. Although we do our best to help you prepare for higher elevations it is a known fact that everyone acclimatises differently. With this in mind, know that running at these altitudes will still be challenging for all whether you are acclimatised or not and you should not expect your body to perform as it does at home. Most runners should expect to hike many sections of these trails, especially during the first few days at altitude. During this time most will enjoy running only the easier flats and gradual downhill sections while hiking the uphills. Because of the beautiful scenery throughout our trips most people have no problem adopting this philosophy of “run when I can, hike when I can’t” and simply take in the beauty of Colorado while hiking. How strong of a runner do I need to be for this trip? This trip is for everyone. You do not need to be an experienced trail runner, ultra marathoner or avid outdoor enthusiast to enjoy our adventures. We invite first time trail runners who might not have access to mountainous terrain at home and want to experience the joys of alpine trail running. Like any endeavour in the mountains, most runners will have a far better experience if they are in shape and should begin a training program well before the trip. We are available for training tips and advice for those who are new to this kind of running. Please note that daily runs are subject to change due to weather and trail conditions. Summer in the San Juans typically produces afternoon thunderstorms that we can plan around by starting and finishing our daily runs early. In the event of bad weather, especially above tree-line, MOST planned runs have a contingency option that will give us a safer run for the day. All runs are optional and you can choose not to participate at anytime. There are many options for flying to SW Colorado with the easiest and most popular option being Montrose (MTJ). We will plan on meeting in Telluride at noon for a group meet and greet and go for a shorter run. Most people on this trip will be arriving from lower elevations and will find that it might take a few days to get used to thin air of the San Juans. With this in mind, the goal of today’s run is to simple shake out and start the acclimatisation process. Following the run we will go for a welcome dinner in town. The Deep Creek Trail is a scenic rolling trail that runs through giant aspen groves, open flower filled meadows and past cascading waterfalls. This trail will have a few short climbs that will require some hiking but has mostly rolling terrain that everyone will enjoy running. The Sneffels Highline is one of the most scenic trails in the area and one of our favourites. With breath taking views wildflower filled meadows, this is the trail run that defines the San Juans. Our final morning will include one more trail run in the high country before departing Telluride. We will plan to be finished by early afternoon to allow plenty of time for everyone to travel home.